We couldn’t run the space without our volunteers, so thank you all very much for your work. Saturday Arts Club and jazz nights. Simon Morrow, Annaliese Garrett, Daniel Pasteiner, Kristijan Jellic and Darren Zlatareff all help out with the jazz nights. Michelle made all of the fabric literature hangers and notice boards in the centre foyer, handmade the door signs in the centre, hung the art work produced by Lambeth children at the Country Show in 2007 and made a name sign for the centre. So much work and you really made the centre look fantastic – thanks. We met James at Lambeth Country Show. Since then he has been to the centre a few times to help with repairs. He also donated materials to create a shelving for the Saturday Arts Club cupboard. As well as helping at the Centre with maintenance & emergencies, Dave has been a staunch supporter of The Bling ya Bike project working with Lamonte Johnson & helped with ‘Fun ‘n Games Day’ in Brockwell Park. Dave is also stewarding for ‘Alice in the Walled Garden’. Fiona has been linked to the centre for a few years now, offering a lot of marketing expertise. She did a fantastic job organising our tent at the show for in the weeks before the event; sourcing the tent, creating an art activity children could take part in, preparing photo display boards about our work and recruiting a team of people to man the tent. Thanks Fiona for all the hard work. Thank you to all the Saturday Arts Club parents, centre users and supporters who came to steward our tent in Brockwell Park in both sun and rain. A special thanks to Brixton Shed volunteers. Libby gave us great support as a volunteer/artist at the Saturday Arts Club. Design student Keezia has been a valued member of the Saturday Arts Club team with a great rapport with the children. She also came with us on the trip to ‘Afrika. Afrika’ at the 02 Centre. Joshua has been supporting the Sound Mix project as a music tutor. 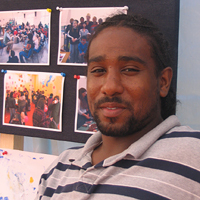 Andre is a young person with great IT skills who has been doing courses at the 198 Gallery. He designed the publicity for the Reel Youth project. James came from the US on a six week work placement in summer. He got thrown into supporting the Development Worker in many different tasks; leafleting and promoting the Reel Youth project, supporting the project and ending up in one of the films, helping with the preparations for the Lambeth Country Show and manning the tent for two days! Many thanks for your help James! . Matthew is a local artist who responded to calls for help painting the disabled entrance. Richie is a local designer who helps the centre with internet and marketing work.